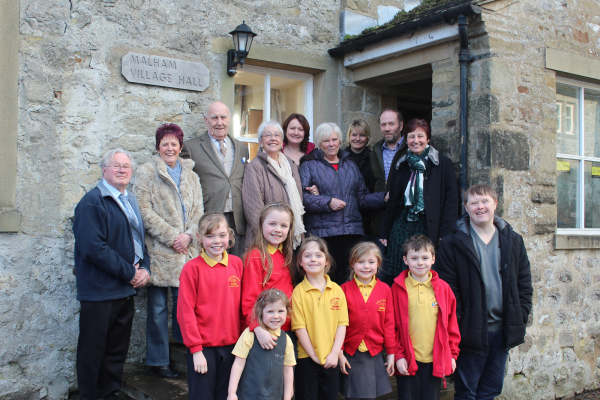 Malham residents – young and old alike – gathered at the local village hall on Thursday, February 26 to celebrate the venue’s 50th anniversary. The hall’s former treasurer John Geldard, 96, was among the guests in attendance who had been at its launch half a century ago. “I was 46 at the time, but it feels like yesterday,” said Mr Geldard, pointing to a black-and-white photograph showing him stood outside the hall during the opening ceremony on Saturday, February 6, 1965. Photo published by the Craven Herald in 1965. Mr Geldard is stood third from left. Also in the picture is Dr Arthur Raistrick and renowned local artist Constance Pearson, who had helped raise funds towards the extension and conversion of the original village Reading Room. “It was just a room with the latest newspapers in and everyone would gather there, but there weren’t any facilities,” recalled local resident John Heseltine, who was at the anniversary celebration and attended the opening ceremony. Katharine Holmes, granddaughter of the late Mrs Pearson, said: “The hall needed upgrading and bringing into the 1960s and grandma wanted to help. She was very interested in the local community”. Together, Dr Raistrick and Mrs Pearson wrote and illustrated a book called a History of Malham, which raised £100 towards an existing hall fund that had been set up more than 20 years previously, according to Mr Geldard. 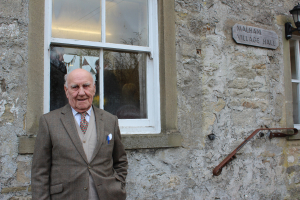 De ja vu: Former Village Hall treasurer John Geldard stands outside the venue just as he did more than 50 years ago upon its launch. The hall conversion, which cost around £2,000, involved the addition of a recreation room, a concert and meeting room, and facilities including a kitchen and toilet. To celebrate the completion of the hall, Mrs Pearson created a large collage of the village, which she unveiled at the opening ceremony. The artwork still hangs in the hall today and is now joined by a second collage by Mrs Pearson, which has been loaned to the hall by nearby hotel, Beck Hall, to mark the anniversary. 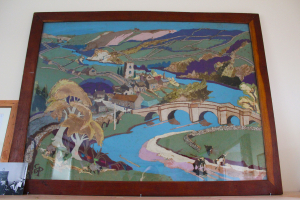 The piece is an abstract collage of the Yorkshire Dales and will remain hanging in the Village Hall for all to enjoy. The artwork donated by Constance Pearson at the opening ceremony is now joined by a second collage by Mrs Pearson (shown here), which has been loaned to the hall by nearby hotel, Beck Hall, to mark the anniversary. Speaking at the anniversary event, Malham Village Hall chairperson Carol Newhouse – whose father, William Harrison, helped launch the hall as its secretary – said: “I’m sure you’ll all agree that the transformation of the Village Hall from the Reading Room has been a great success. “We’ve all enjoyed many events over the years; I remember coming to the Sunday school events here as a little girl and then coming back with my own children,” Mrs Newhouse added. Today, the hall continues to bring the community together with activities ranging from Pilates classes to Malham’s Women’s Institute meetings. 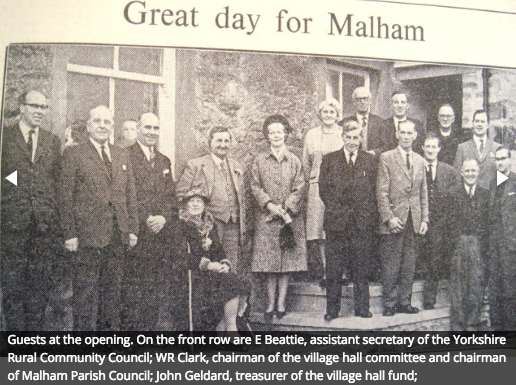 The anniversary celebration was organised by local resident and Malham Village Hall committee member, Imogen Swales. Mrs Swales commented: “It’s important to mark these occasions and it would be nice to be here again for the 100th birthday”. She went on to thank local businesses including The Old Barn Cafe, River House, The Buck Inn, Beck Hall, Gordale Snack Bar, Miresfield Farm and The Lister Arms, who contributed sandwiches and cakes. The event was attended by more than 50 people, aged between six months and 96. Words and pictures by Louise Macbeth.